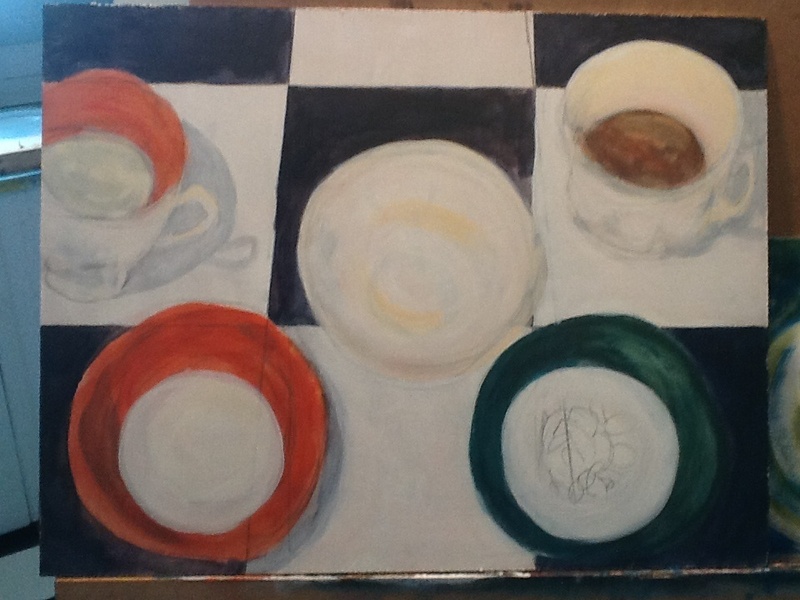 Today I ponder painting … My painting … The orange green and white painting I had hoped to finish and post today. Work in progress … That’s what it is … Work in progress … Good name for an artpiece that gets stuck somewhere between the “so inspired” and “don’t quite get it” stage … that space where the little voice begins to niggle and you wonder whether this one is any good … Whatever “good” means. Good enough? For what? Compared to what? That the expression “oh you are so talented” might make an artist squirm isn’t unusual and the squirming does not necessarily mean the artist is modest and awkward about accepting compliments. Talented is simply not the best word to use. Why? 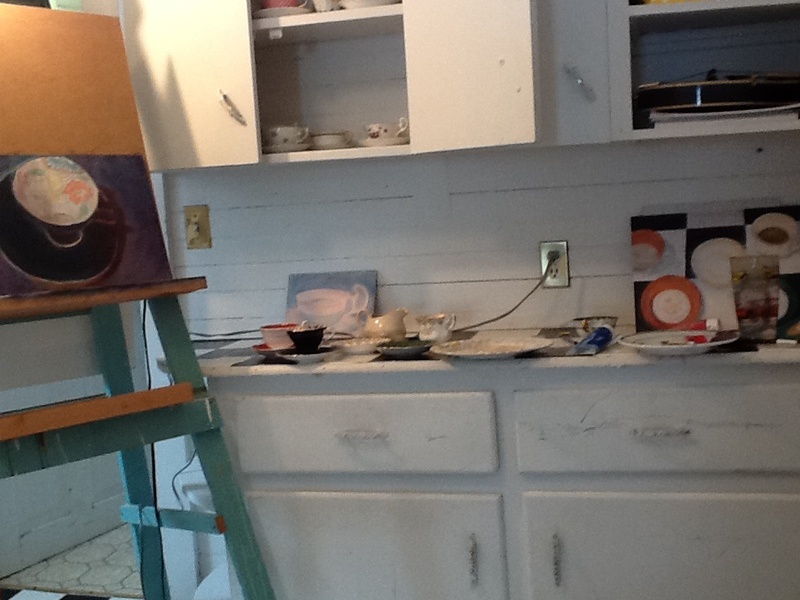 Because an artist’s work is just that … Work! That the artist might actually enjoy the work is something else. So much of art is really about seeing and working … Stepping back and looking again … perhaps from a new angle … trying to communicate what is seen … Reworking the art … re-aligning an image over and over both in the mind and on the canvas. I am doing just that sort of reworking on the painting I started last week, the one I thought I could quickly finish in a day. A new week has begun and I am still struggling … Ahh … work in progress … Now there is a useful expression. “Everything is gonna be alright”. Today is special for being the first day of another summer, another opportunity to plant seeds and grow good food. This picture was done for another summer. Some summers are good for growing. Some summers are for waiting and seeing. 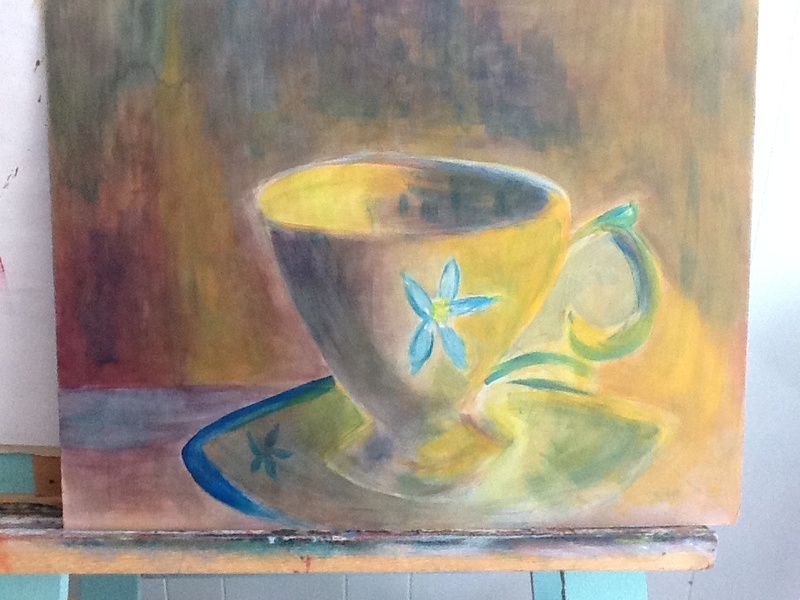 Yesterday’s cup painting is a wait and see. Meanwhile here is a last year’s picture of Maggie with a handfull of herbs. Looking back to what I did yesterday and the day before … And I think … An art project … Or a peace project … Can there ever really be a finishing point? Don’t these things just go on and on … So how does one set a price? What if there is no buyer? Is it all just wasted time and effort? What is art worth … What is peace worth?